Rarity Roundup weekend in Worcester Co., Maryland. Last updated: 11/17/2008. 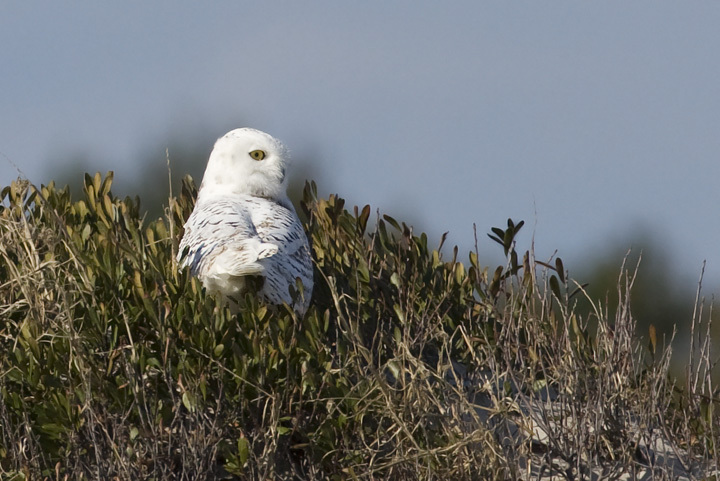 Above and below two: A beautiful Snowy Owl on the ORV zone on Assateague Island, Maryland (11/16/2008). 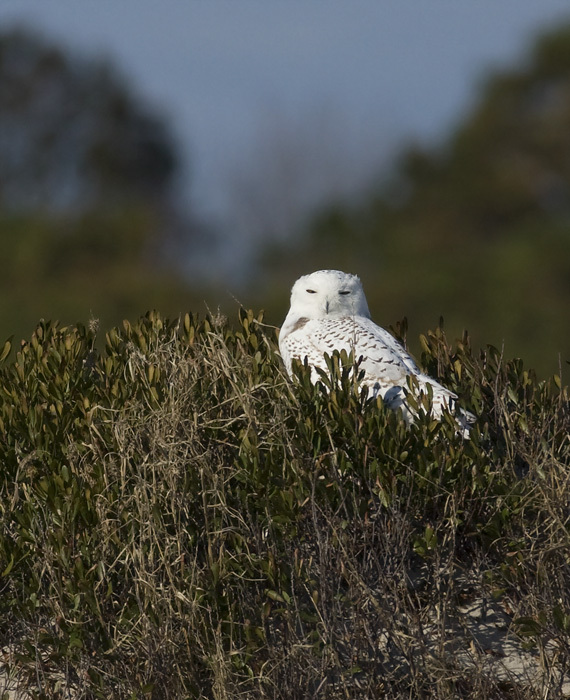 The bird was first located by park staff on 11/7, and it was re-found during the Rarity Roundup by Stan Arnold and Kevin Graff. 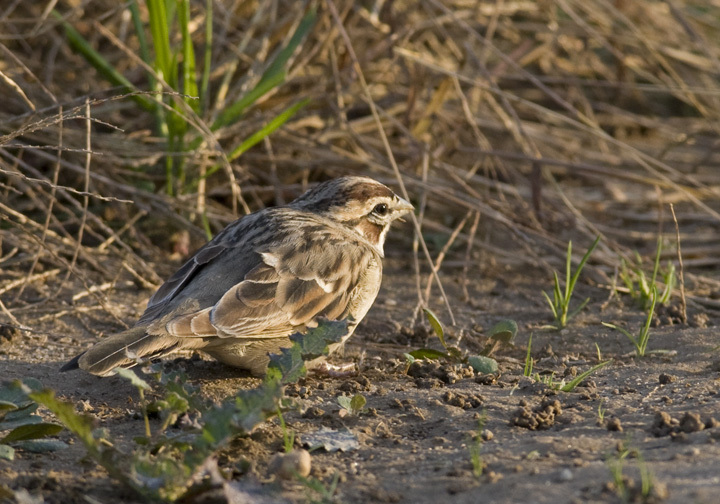 Below: A late migrant Grasshopper Sparrow at Bayside on Assateague Island, Maryland (11/16/2008). 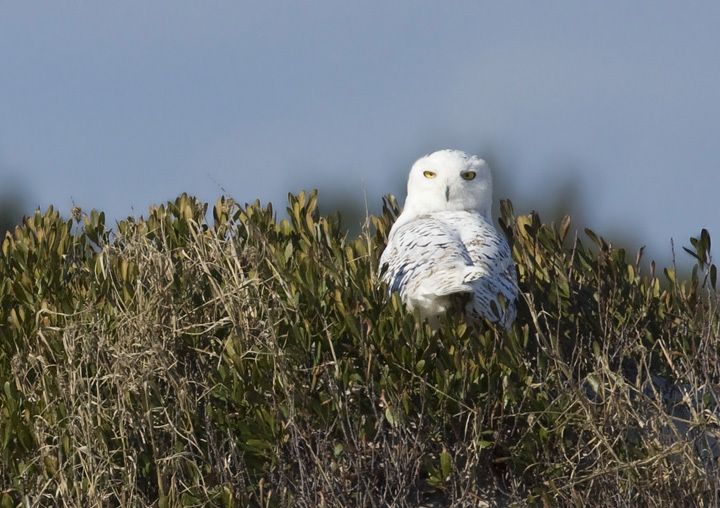 Found by Jim Stasz, this is a very rare sighting for November and for the island. 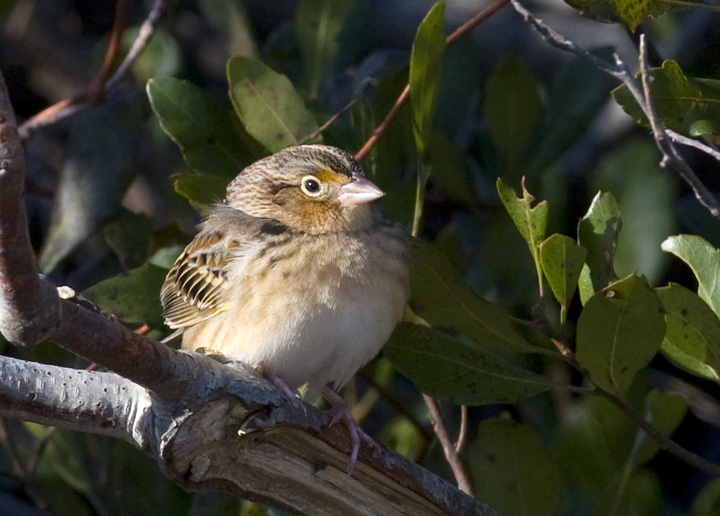 I never noticed until this close-up study how similar the species' nape pattern could be to Le Conte's Sparrow. 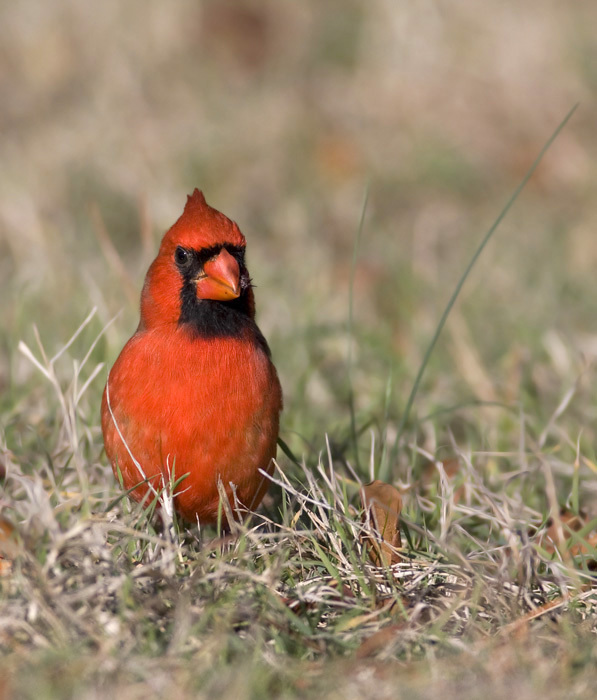 Below four: While working through flocks of birds on Assateague, I found a new reason to appreciate cardinals. 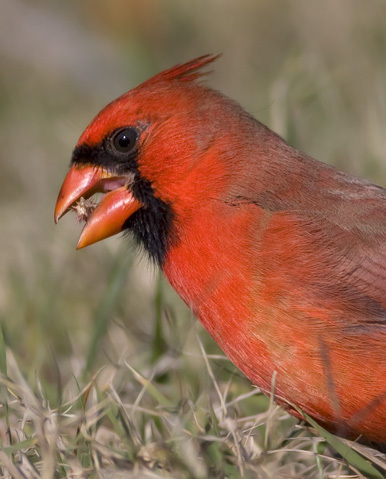 They feed on even the cruel, sharp seed heads that are more than happy to engulf your shoes and socks. 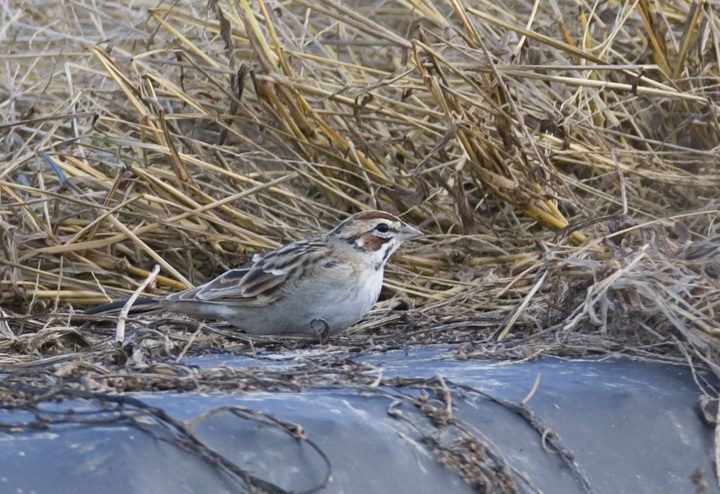 Below: A Lark Sparrow in Somerset Co., Maryland (11/16/2008), an excellent bird found last weekend by Jim Stasz. 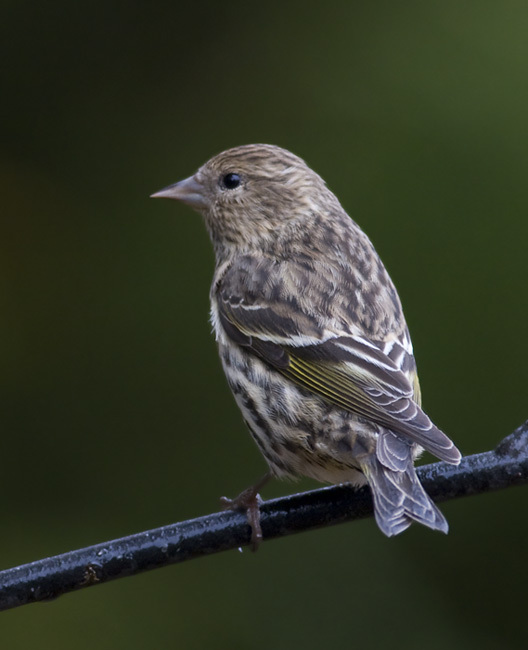 Below: On Friday, the harsh weather brought a large flock of Pine Siskins to our backyard feeders (Pasadena, Maryland, 11/14/2008). 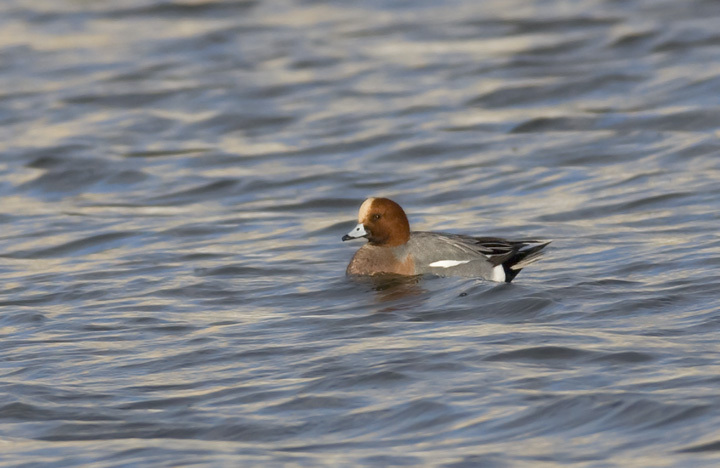 Below: A drake Eurasian Wigeon was yet another highlight of the Rarity Roundup weekend, this one found by Jim Brighton and Mikey Lutmerding (Worcester Co., Maryland, 11/16/2008). 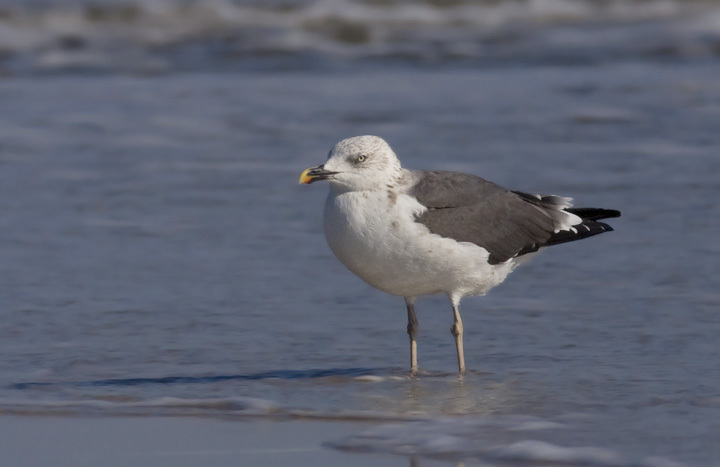 Below two: Perhaps the strangest near-adult Lesser Black-backed Gull I've seen. It might fall somewhere within the expected range of variability for a bird going into its third winter, but I've never seen this combination of field marks before. 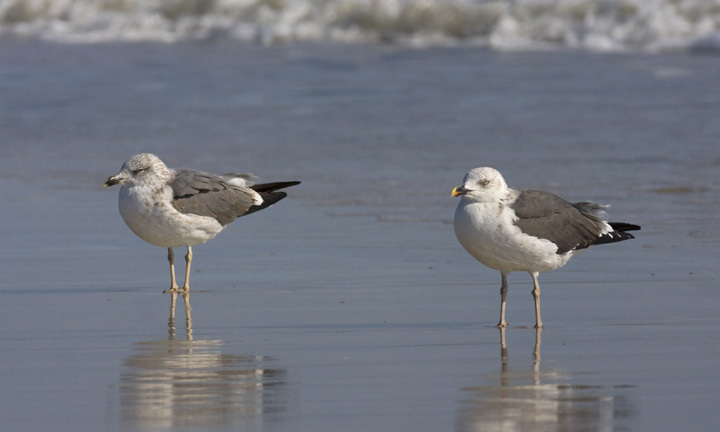 In second image, it is seen with a very different third-winter Lesser Black-backed Gull (Assateague Island, Maryland, 11/16/2008). 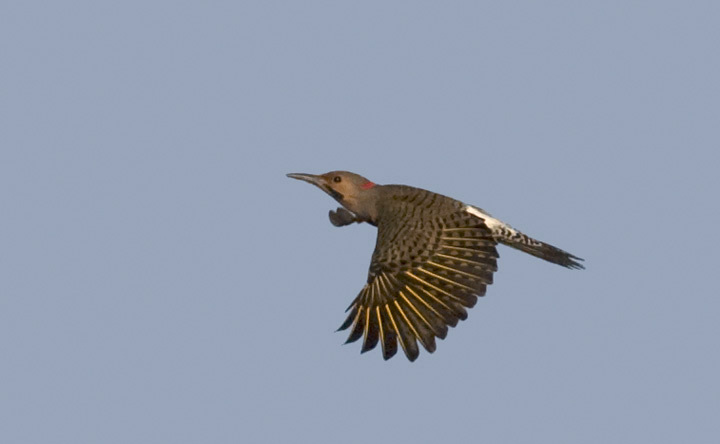 Below: A male Northern Flicker in flight over Assateague Island, Maryland (11/9/2008). With wings fully extended, you can see the yellow shafts of the feathers that give our eastern birds their subspecies name, Yellow-shafted Flicker. Below two: Below are a few awful documentation photos of great rarities. First, here are two images of a Cave Swallow at Berlin STP, Worcester Co., Maryland (11/15/2008). These were taken under overcast, drizzling conditions, and I had to take them while holding my cell phone to my ear! 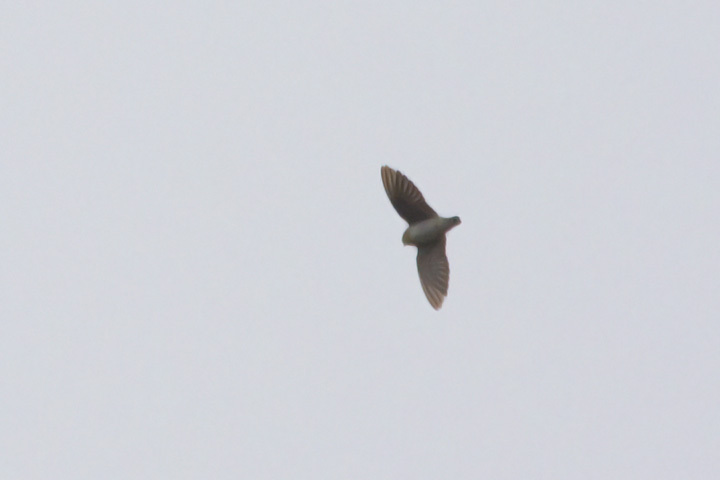 You can see the throat color is light (clearly buffy in the field) and that it contains no dark markings. Note the squarish tail shape and that the bird is molting its inner primaries just as last year's birds were at this time. Addendum: Marshall Iliff points out that Cave Swallows molting primaries in November are hatch-year birds. According to Pyle (1997), adults should have completed molt by October. Thanks, Marshall! Below: But hold on, I can do worse! 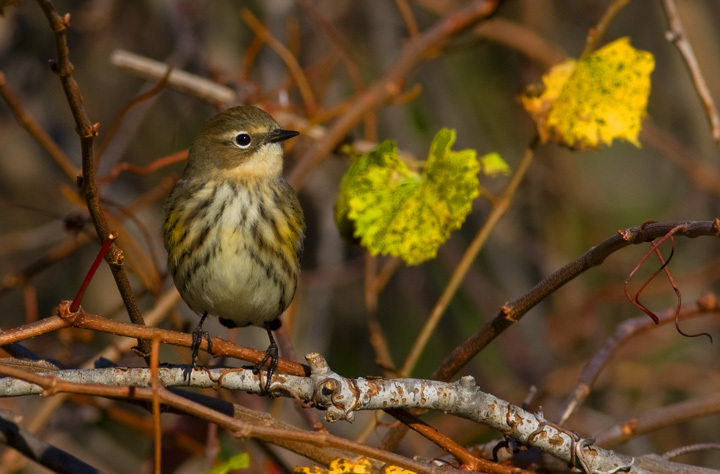 Here is a photo of an Audubon's Warbler, the western subspecies of Yellow-rumped Warbler, photographed at the Glen Riddle development west of Ocean City, Maryland (11/15/2008). I first noted this bird by its distinctive chip, which stood out as odd compared to the hundreds of Myrtles I'd seen all day. 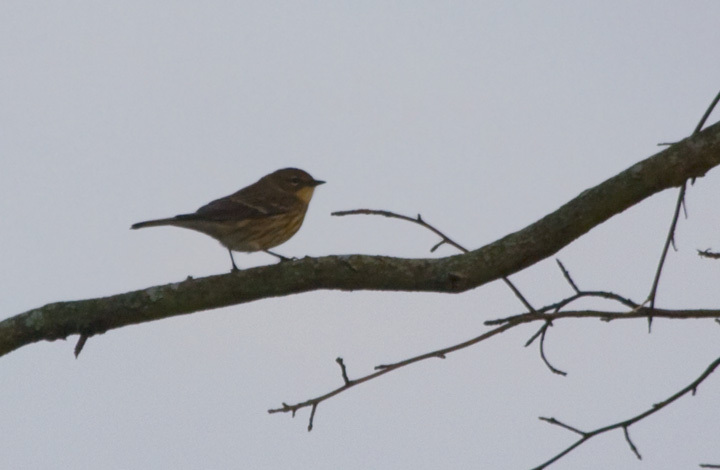 I looked up and quickly noted its bright yellow throat, which was rounded on the corners instead of continuing under the auriculars (what I think of as the smiley face). You can see some light color in this photo in the middle of the neck, but this is caused by lighting and was not a continuation of the throat color. The face is plain, with two eye arcs but no white stripe as seen in Myrtle. All field marks were more pronounced in the field. 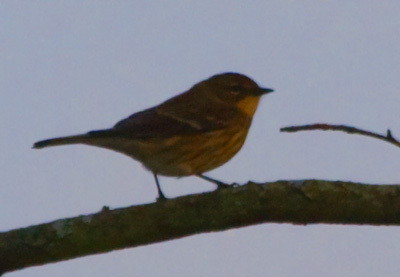 The bird was photographed in low light near the end of the day. This appears to be the 12th report of the species in Maryland, and only two have been reviewed and accepted. (Most have not yet been reviewed). Below: For fun, let's try some rare bird forensics. I've found that in overexposed and underexposed photos, you quickly lose color. However, you can often get a better sense of true color by manually increasing overall (i.e., all color) saturation. While this might be considered "doctoring" a photo, you cannot saturate a color that isn't there. 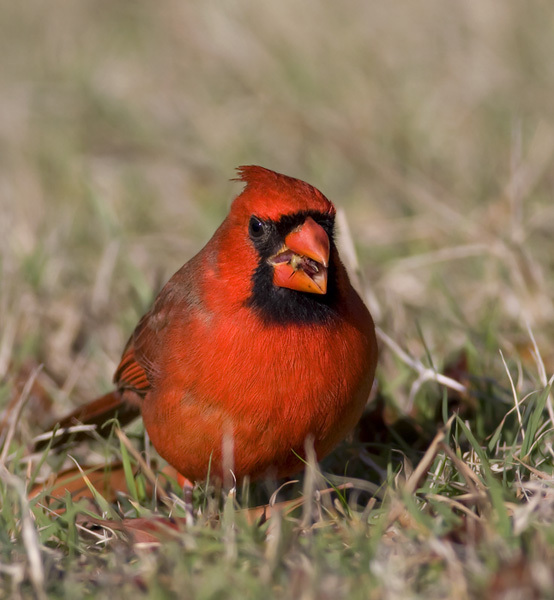 When I saturated this original image, the yellow on the throat quickly becomes strong. Below: To keep this remotely scientific, here is a random Myrtle Warbler shot with the same high saturation applied. The throat does not become saturated with yellow, while other yellow markings become intensely yellow. 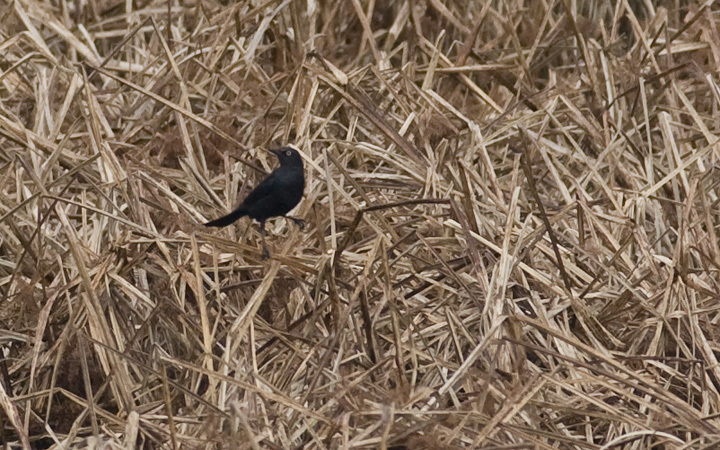 Below: A male Brewer's Blackbird at Berlin, Worcester Co., Maryland (11/15/2008). This bird was decidedly glossy, showing no hint of rusty coloration seen in nearby male Rusty Blackbirds. Many observers were treated to extended scope views of this individual, the most cooperative I've ever heard of in Maryland. 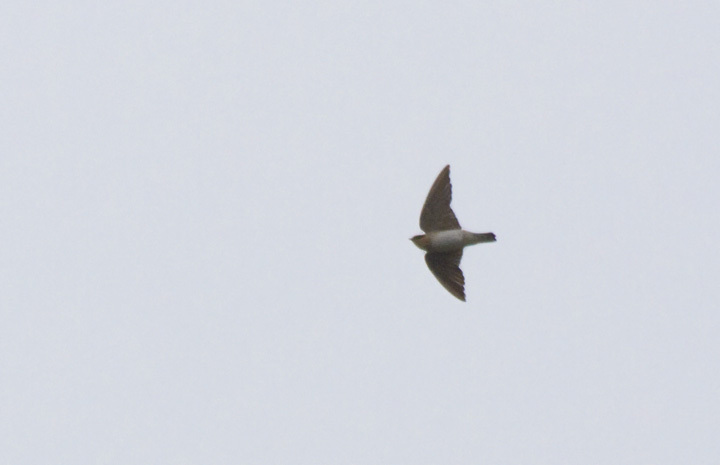 The highlight for me was listening to the bird sing several times, a distinctive, weaker, less emphatic, (burrier? ), take on Rusty Blackbird. I think of Rusty Blackbird song as a Japanimation character drawing a sword--Shiiiiing!--while Brewer's isn't nearly as emphatic. 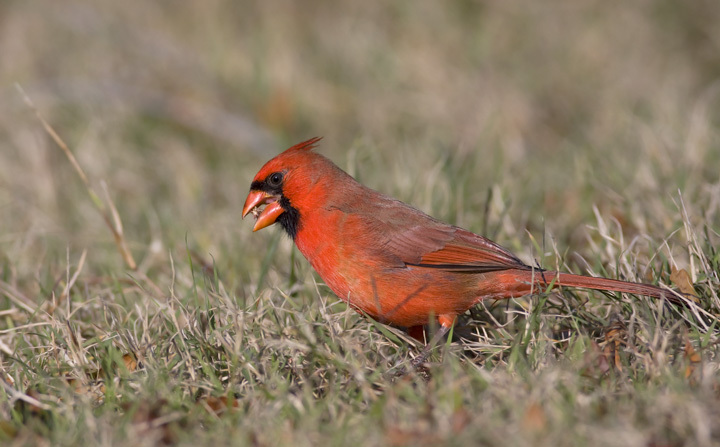 Below: A cold front passed through on Saturday night, bringing impressive numbers of sparrows, robins, and other species to the Maryland coast. 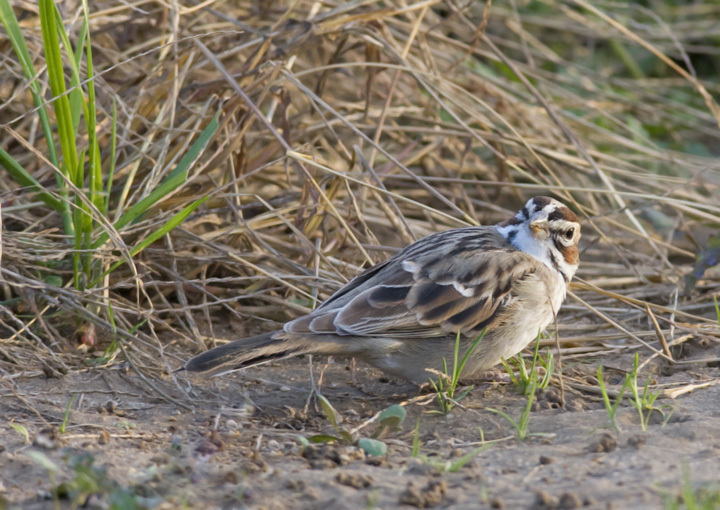 Large flocks of White-throated Sparrows were especially conspicuous as they fed at nearly every roadside on the island. 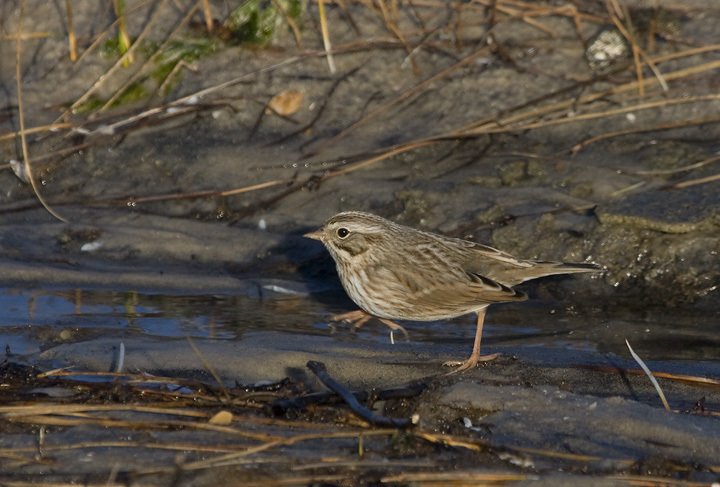 This very streaky young bird is making its first trip south for the winter (Assateague Island, 11/17/2008). 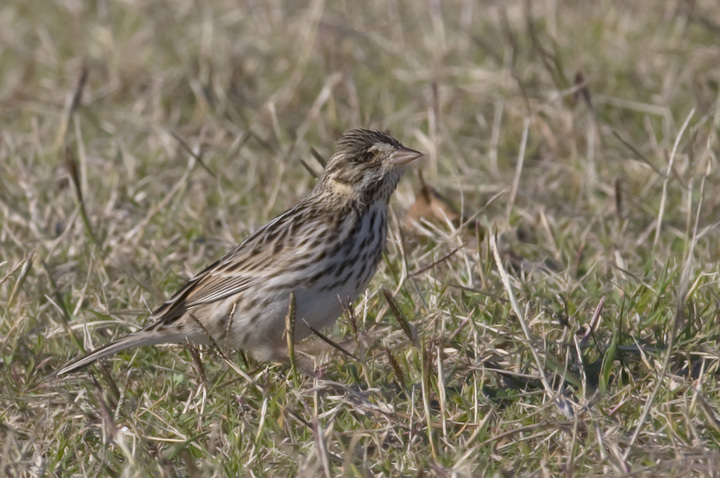 Below two: An Ipswich Savannah Sparrow on Assateague Island, Maryland (11/9/2008). 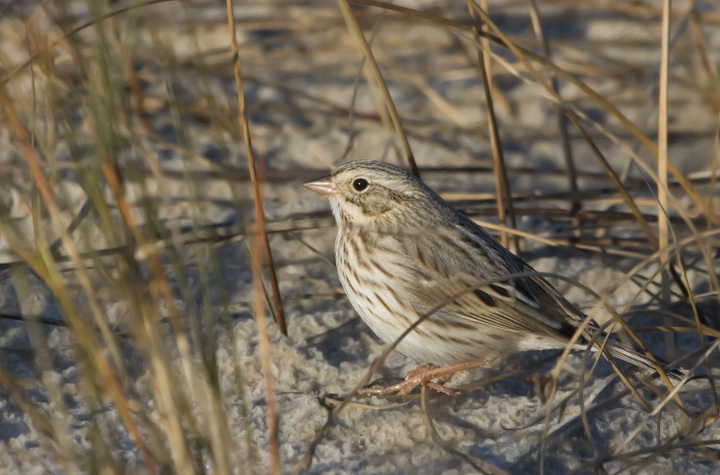 This distinctive subspecies nests only on Sable Island, Nova Scotia, and winters along the Atlantic Coast. The plumage of this population is perfectly suited for life on the dunes. 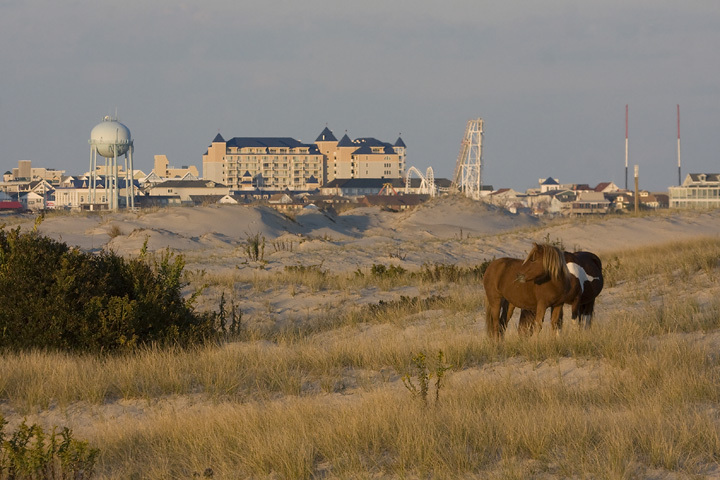 Below: Ocean City as viewed from the wilds of the north end of Assateague, a view enjoyed only by those foolish enough to weather the notorious death march (11/9/2008). 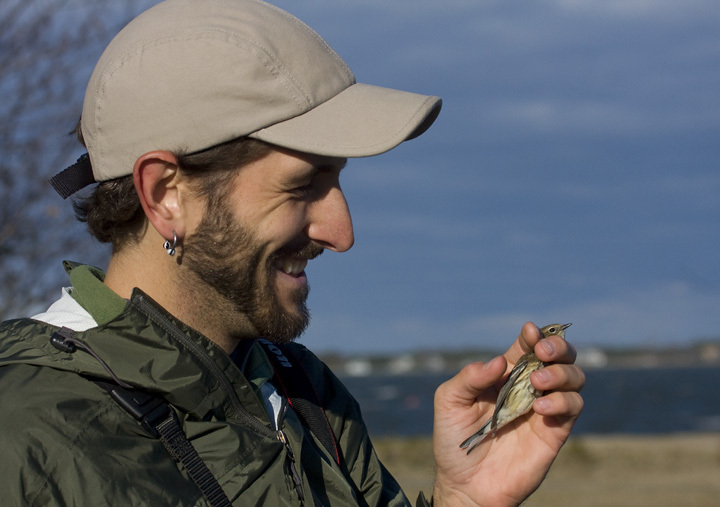 Below: Mikey Lutmerding with a Myrtle Warbler that he rescued after we found it trapped in an Assateague Island public restroom (11/17/2008). 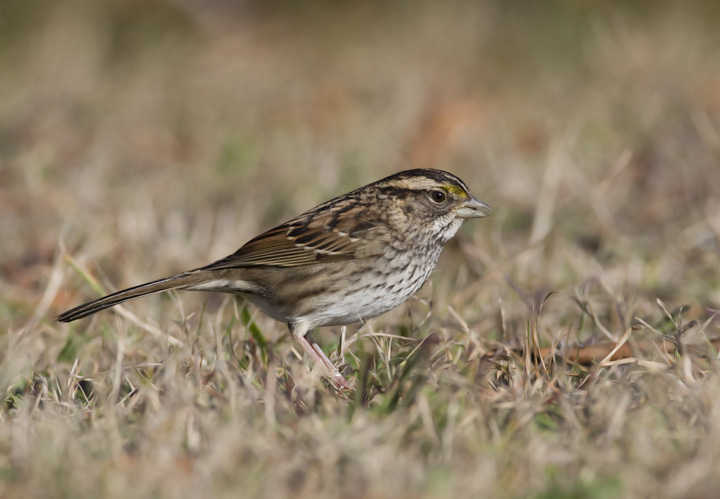 Below: This eastern Savannah Sparrow was foraging normally at Bayside, but as I photographed it, I noted it had lost its right eye. Nature is harsh. 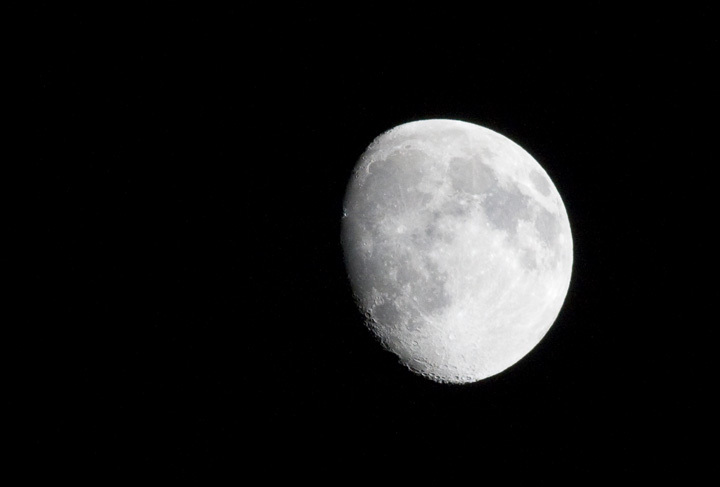 Below: The moon over Assateague Island.